Ever wonder why auctioneers bother putting price estimates on notes? Is it an attempt to pump up bids or just to serve as reference? If you took part in the 2011 PCDA auction brokered by Lyn Knight Currency Auctions no doubt you noticed a few high denoms going for very reasonable prices. 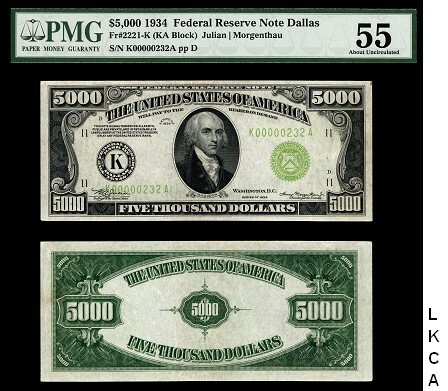 We had our eye on a $5,000 note pictured below, lot #1339. Most would think this note, a 1934 $5,000 PMG AU 55 would have easily approached at least $100,000 during bidding, but unfortunately it closed at $60,000 – the note’s starting bid. In reality this wasn’t really “unfortunate”, since the winner got a great note at a great price! It’s also worth noting a PCGS Gem 65 $10,000 Binion Note hammered at just $75,000 USD, another very reasonable buy for the lucky winner. There could be any number of reasons why these notes fetched lower than expected prices. Chief among them is the slow national economy. Additional reasons might be the time of year (people are saving for the holidays), auction “hang-over” from the Long Beach currency auction held a month earlier, and lack of publicity. To be sure, there were many top dealers at the PCDA auction gathering, all selling notes from their tables; so this $5,000 note wasn’t exactly kept hidden from the general public. We encourage you to check out our notes! There is NO buyer’s premium. Make offers on notes listed in some of the world’s top USA currency dealer’s inventories, and do business your way! No shill bidding or collusion to worry about: you make an offer and go from there.